18. Astronomy in the images and figures. 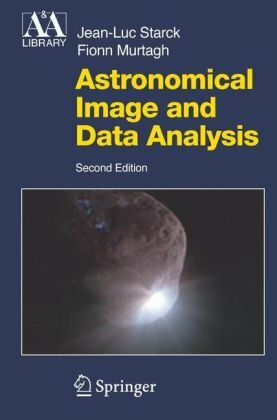 With information and scale as central themes, this comprehensive survey explains how to handle real problems in astronomical data analysis using a modern arsenal of powerful techniques. It treats those innovative methods of image, signal, and data processing that are proving to be both effective and widely relevant. The authors are leaders in this rapidly developing field and draw upon decades of experience. They have been playing leading roles in international projects such as the Virtual Observatory and the Grid. 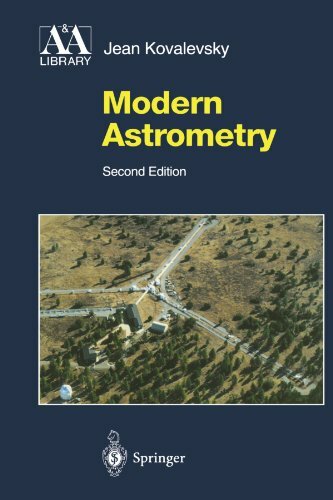 The book addresses not only students and professional astronomers and astrophysicists, but also serious amateur astronomers and specialists in earth observation, medical imaging, and data mining. The coverage includes chapters or appendices on: detection and filtering; image compression; multichannel, multiscale, and catalog data analytical methods; wavelets transforms, Picard iteration, and software tools. This second edition of Starck and Murtagh's highly appreciated reference again deals with topics that are at or beyond the state of the art. It presents material which is more algorithmically oriented than most alternatives and broaches new areas like ridgelet and curvelet transforms. Throughout the book various additions and updates have been made. 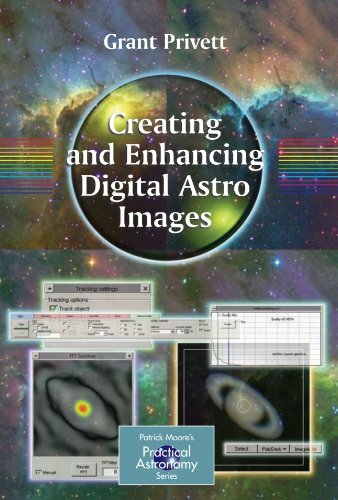 The book will, in jargon-free blow-by-blow terms, describe how to create the best astronomical images you can with the digital camera equipment at your disposal. It will explain the steps we go through to extract results from the raw-and-dirty original imagery, and then transform them into high quality pictures that you could hang on your wall. The advent of CCDs, and more recently inexpensive webcams, has led to a much greater proportion of amateur astronomers becoming involved in digital imaging. The low price of the new Meade Deep Sky Imager - $299 (2005) – suggests that within a few years a simple digital camera will become a standard accessory for any telescope. There are as yet few books available on this aspect of amateur astronomy. This situation is likely to change in the next few years and there are going to be lots of people out there asking questions like "Flat field? What does that mean? ", and trying to work out how to get the best out of their webcam, CCD or Digital SLR. They will also be wondering what is the best software to use. To summarise; this is a book that tells practical astronomers (and that includes some but not all professionals) what is needed to get from standing in the dark with a telescope and a camera, to showing your spouse, local society friends or even supervisor the astonishing images that can be obtained with simple equipment but the right software and knowledge of how to use it. The Zen approach to astro imaging? Save your money! This is a 142 page booklet, the essence of which could have fit easily in less than 100 pages. The writing style is wordy and abstract.The depth of coverage would suffice to enlighten only the totally uninitiated, and then only barely. Save you money. I had hoped the book would help me process some of my astrophotos.It provided lots of general information about taking and processing the photos but offered nothing specific to any equipment or software. I have been a serious photographer for several years, and an intermediate astronomer for the last couple years.I have recently decided to try and marry these two interests together in the form of astrophotography.This book has been an outstanding source of practical, usable information that has made the transition to using a telescope in conjunction with my cameras much easier and more enjoyable.I especially benefited from Privett's section on Image Reduction; I found several mistakes in my technique that I was not even aware I was making.Privett has a very readable writing style, and he also uses a subtle sense of humor to make the reading enjoyable, and not just a dry technical treatise.I also own one of Privett's other books, The Deep-Sky Observer's Year, and these two books go together very well for planning what to shoot, and knowing how to shoot.I heartily recommend this book for anyone who wants practical advice on how to improve their digital astrophotography results. The aim of the State of the Universe annuals is to provide an annual astronomy review suitable for the popular science level reader to be published every September in a format that will be suitable for, and appeal to, the Christmas market. The book will cover all major astronomical news on topics beyond the Solar System and place them in the context of the longer term goals of astronomers and astrophysicists around the world. The aim is to capture the excitement and vibrancy of modern astronomical research. This section also includes web links for all major news stories, providing a bridge between the public news stories and the actual research web sites. Chapter 1 – ‘A Year in News and Pictures’, written by Martin Ratcliffe, appears every year and makes up the first half of the annual. It will present brief summaries of the major announcements, discoveries and news items from that year, with the major ones being explained in detail through later chapters written by invited contributors who are at the forefront of research in these fields. The January meeting of the American Astronomical Society each year will be the major source of astronomical news for the following year’s volume, giving access to potential authors and contacts with public information officers of major observatories, space centers, etc. The invited contributions which make up the second half of the annual each year will cover a variety of topics and are written to appeal to a wide readership. These are written by leading astronomers or science writers. One feature introduced in the first volume, the overall review of the State of the Universe by Dr Jim Kaler will be retained for State of the Universe 2008. The set of appendices at the end of the book will include a list of launches of major astronomical observatories/satellites during the past year; a list of planned future astronomical satellites; basic data on all astronomical observatories currently in operation with web links for the reader who wishes to find out more. I bought this book as a gift. The recipient has had an interest in Astronomy for many years. He found the book lovely to look at, interesting to read. A great addition to his personal library, where he can browse it over and over again. A good book for a novice and still a good book for someone more knowledgable. This is an excellent book if you are simply looking to update yourself on what's currently going on in the aerospace, astronomy, astrophysics, optics, etc. fields.It gives just enough information to enlighten one on the latest and greatest of these fields.However, if you're looking for a more in-depth look at the multiple topics presented in this book, you'll have to turn to supplementary materials (which this book does a good job of referencing so that you don't have to conduct in-depth supplementary materials searches yourself).It readslike a magazine full of editorials, and they are written by scientists and researchers who are renowned in their respective fields of research. It is a bit redundant in places, as it covers some topics that were "cutting edge" in the previous volume, "State Of The Universe 2007. "But that is to be expected, as many such topics can remain at the forefront of these fields of interest for years at a time.Nevertheless, there is plenty of new material, making it worth while to get "SOTU 2008" even if you have "SOTU 2007." In summary, this book does exactly what it was intended to do - inform interested parties of what's going on at the forefront of the many astronomically-related fields in a clear and concise manner. This book should be in the reading list of every educator who is involved in teaching Astronomy. Martin Ratcliff has collected in one publication information that would require many hours of research from the worlds leading authorities in each subject. I particularly liked the references given to each entry and have been able to contact via e-mail a number of the contributors to raise questions and gain further information. A must in any library. 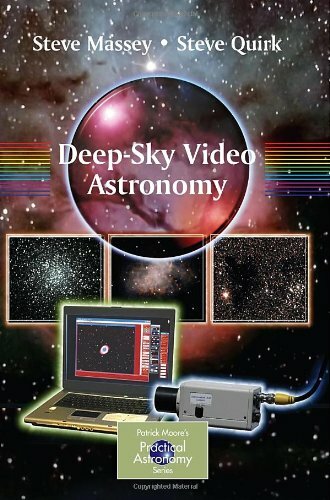 Deep-Sky Video Astronomy is a concise guide to using modern integrating video cameras for deep-sky viewing and imaging with the kinds of modest telescopes available commercially to amateur astronomers. It includes an introduction and a brief history of the technology, camera types, etc. The authors then examine the pros and cons of this unrefrigerated yet highly efficient technology, which is already beginning to compete with expensive astronomical cooled-chip CCD cameras in quality and ease of use. There is a thorough examination of accessories used to achieve particular results. Examples are focal reducers, Barlow lenses, and optical filters. However, the focus is mostly on the practical side of creating beautiful and detailed astronomical portraits using image-stacking software, enhancement tools like PhotoShop, and creating color images with a black-and-white camera. Practical step-by-step examples supported by tried and trusted tips show how to achieve the best possible deep-sky video portrait! The other reviewer hits the nail on the head. With only about 13 pages devoted to describing the various video cameras available this book leaves you with more questions than answers about camera selection. I tracked down websites for the various cameras mentioned and I was unable to make a sensible comparison of their features. The cameras mentioned range from $275 to $800 and they clearly feel this is the best bang-for-the-buck. There is a passing mention of webcams, but little more. There is no mention at all of Celestron's Celestron NexImage Solar System Imager. That said, the bulk of the book is an in-depth step-by-step guide to manipulating the raw video you have captured and explains how to get the best possible images. The book is also filled with great photos, each listed with the telescope specs listed, but not always the camera model. There's also a nice little section on using a video camera for guiding. If I ever buy a video camera this book will be invaluable; but I'll have to find another source of information to guide my camera selection. Massey and Quirk's (M&Q) latest book is largely a prescriptive guide to operating a monochrome frame-accumulation video camera with a telescope.It tells the user what to do and when to do it.It describes the GSTAR-EX camera sold by Massey, and the well-known Registax program, and spends a lot of time in describing the steps the operator must go through to get results from the astrophoto session. M&Q spend most time on the GSTAR-EX camera sold by Massey, with only occasional mention of other competing products (StellaCam, Mintron, Watec, Imaging Source) and no mention at all of the Mallincam Hyper.This is not a criticism; if you use one of these other devices you will still find the book useful. Careful reading is needed to tease out equipment configuration which will work with a given telescope.This is one area where M&Q could have spent more time, as it represents the greatest cost to the isolated amateur trying to get things right.The writers are also exclusively PC-centric, but if you use Macs you may still find the broad steps applicable to the software you do use. The gallery at the end of the book is spellbinding, and shows M&Q's consummate abilities at the telescope.Enviable indeed.The section on "photographs from light polluted skies" gives some idea of what can be achieved with the GSTAR from suburbia using moderate telescopes (8 - 10" Newtonians and SCTs, 4" ED refractors, etc). My verdict - the book is a worthwhile addition to the amateur's library.It will not provide as much background theory as the amateur might wish for, but in its stated aim of introducing the amateur astronomer to video astronomy, it does a very good job. 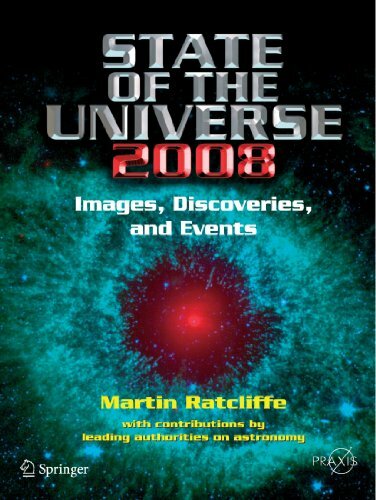 The aim of State of the Universe 2007 (and subsequent volumes issued annually) is to provide an annual astronomy review suitable for the popular science level reader to be published every year in September in a format that will be suitable for an appeal to the Christmas market. The book will cover all major astronomical news on topics beyond the Solar System and place them in the context of the longer term goals that astronomers and astrophysicists around the world are aiming for. The target is to capture the excitement and vibrancy of modern astronomical research. The book will present a complete list of the major announcements, discoveries and news items from each year, with the major ones being explained in detail through selected chapters being written by invited contributors who are at the forefront in those fields. 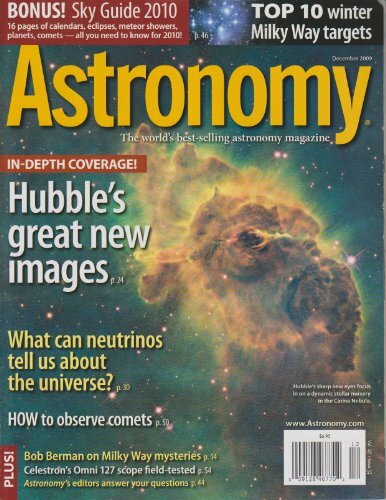 The January meeting of the American Astronomical Society each year will be the major source of astronomical news for the following year’s volume, giving access to potential authors and contacts with public information officers of major observatories, space centers, etc. The regular set features, which will appear every year, will include an annual chronological list of the latest discoveries announced during the previous twelve months; a review of the major news stories of the year with the main characters; a list of launches of major astronomical observatories/satellites during the past year; a list of planned future astronomical satellites; basic data on all astronomical observatories currently in operation with web links for the reader to dig deeper; list of anniversaries and landmarks; the latest from the BadAstronomy website by Dr Phil Plait, and the cartoon feature. 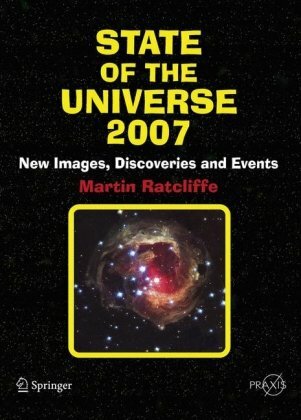 I work in a small planetarium, and Martin Ratcliffe's "State of the Universe" is a terrific resource for us.We don't have the budget to have a real astrophysicist on our staff, so for us, Martin's book is an ideal way to stay relatively current on cosmology.Anybody with an interest in astronomy would love this book.Can't wait for next year's edition. When I read about the book I was quite excited and when I received the book, a few days ago, I was not disappointed. The book has a part dedicated to brief news and other with in-depth articles about very interesting topics (gravitational waves and LIGO, supernova 1987A remnants, gamma ray bursts...) and appendixes with data about current and future telescopes and extrasolar planets. I have still not finished it, but it won't take me long to. Only slight cons is that I expected it to cover 2006 news and, because editorial schedule, it covers march 2005 - march 2006. Then maybe State of the Universe 2007 was not the most proper or accurate title. Other con was that I expected glossy paper, and it's not, Mate astronomical pictures are not so spectacular, but I guess this way it's cheaper (and more ecologic?). Modern astronomical telescopes, along with other advances in technology, have brought the deep sky ? star clusters, nebulae and the galaxies ? within reach of amateur astronomers. And it isn?t even necessary to image many of these deep-sky objects in order to see them; they are within reach of visual observers using modern techniques and enhancement technology. 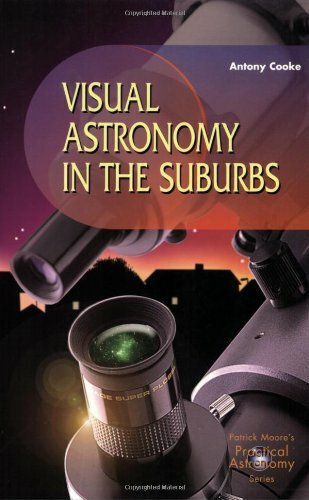 The first requirement is truly dark skies; if you are observing from a light-polluted environment you need Tony Cooke?s book, Visual Astronomy in the Suburbs. Given a site with clear, dark night skies everything else follows? 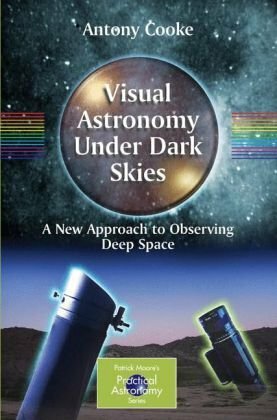 this book will provide the reader with everything he needs to know about what to observe, and using some of today?s state-of-the-art technique and commercial equipment, how to get superb views of faint and distant astronomical objects. James Elkins has shaped the discussion about how we—as artists, as art historians, or as outsiders—view art.He has not only revolutionized our thinking about the purpose of teaching art, but has also blazed trails in creating a means of communication between scientists, artists, and humanities scholars. 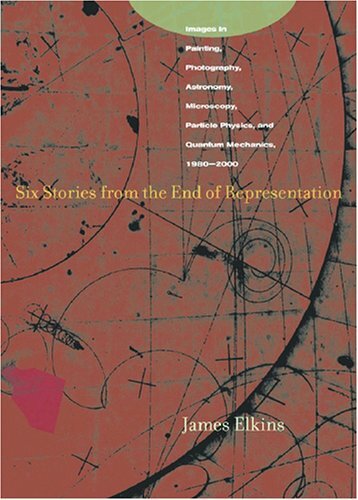 In Six Stories from the End of Representation, Elkins weaves stories about recent images from painting, photography, physics, astrophysics, and microscopy. These images, regardless of origin, all fail as representations: they are blurry, dark, pixellated, or otherwise unclear. In these opaque images, Elkins finds an opportunity to create stories that speak simultaneously to artists and to scientists, and to open both those fields to those of us who have little purchase in either.Regarding each image through the lens of the discipline that produced it, Elkins simultaneously affirms the unique structure of each way of viewing the world and brings those views together into a vibrant conversation. Not all amateur astronomers who live in a suburban location realize just how very effective a ‘chilled-chip’ astronomical CCD-camera and software can be at cutting through seemingly impenetrable light-pollution. CCD Astrophotography from the Suburbs details one man’s approach to the problem of getting high-quality astronomical images under light-polluted conditions. 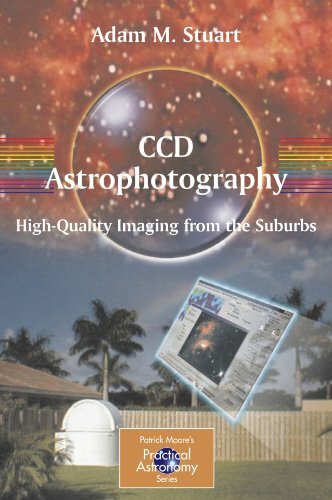 Adam Stuart has written this reference book for all amateur astronomers who are interested in CCD imaging, especially those who have to work under suburban conditions. 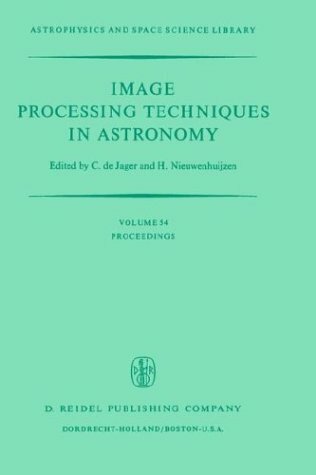 The book outlines the materials and (commercially-available) equipment used for high-quality imaging. The many wonderful images Dr. Stuart has produced allow the reader to see the product of – initially – a fellow beginner’s efforts. The glorious images found in numerous books, and especially those seen in Sky and Telescope magazine – might seem out of reach. But this is not really the case. Respectable images are attainable with modest equipment. This book outlines a complete and thoroughly tested working program for every beginner to achieve high-quality digital imaging. This book is giving a great picture of all aspects for CCD Astrophotography. It is a very good guide for Begineers! This book is basically broken down into two parts.The first 80 pages are all about the author's equipment and setup.The second 80 pages are images he took. The first part may be useful if you have the exact same equipment but, if not, you won't get anything out of it.His images range from mediocre to great, but there is no information on how he captured or processed them.In short, this is just a great big pat on the back by the author for the author.Don't waste your money, you'll get nothing for it. What a disappointment... this book was not useful to me for any purpose other than to read about the equipment & software used by the author.It's nothing more than a chronology and documentary on the equipment HE owns and uses, but there is absolutely no information on HOW to use it.I was expecting and/or hoping for "reference" type information, but the book is essentially useless for this purpose.The author will tell you everything you want to know about HIS equipment and setup (in a manner that goes over the head of nearly all beginners) but does absolutely nothing to educate you on how to effectively take "high quality astrophotography from the suburbs".Even worse, half of the book contains nothing more than photos that he took, but there is no information on technique.If you want a "guided tour" of the author's setup, then you'll love the book, but if you want to know anything at all about how to use it, or even better... how to use your own or other equipment, absolutely positively 100% stay away from this book.I think the book is a scam-- to get you to buy and use equipment owned by the author.I wonder if the different equipment manufacturers and vendors pay the guy to name-drop and "advertise" in his book.What a disappointment. At first I did not like the book much and it sat on my shelve. I revisited it recently and have changed my mind. There is a lot of information contained within its pages. It may not be the best laid out book for beginners and the Observatory section needs to be dropped, never the less if you read through it you can learn a lot. It is with out doubt an improvement on some of the astrophotography books in the Practical Astronomy series, some of which should never have been printed but there is still room for a good intro book in this area. I could hardly wait for this book because I live next to a more than 2 million-city (Budapest) in Hungary and half of the night sky is terrible from my backyard; so the main reason behind my ordering this book was its subtitle. At the same time, there are too many pictures (roughly 1/3 of the book!!!) as sample image collection. Some of them are really very nice shots and some others are poor but without any explanations regarding the features of their capture and/or image processing. 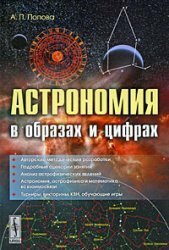 An introduction to practical astrometry, dealing with the determination of positions, motions, distances and dimensions of celestial bodies ranging from quasars to artificial satellites. For this 2nd edition, the release of the Hipparcos and Tycho catalogs, the rise in CCD astrometry and the adoption of a new celestial reference frame by the IAU led to a significant modification of the text. And, especially, the outlook for astrometry has been completely rewritten. Many amateur astronomers live in or near cities and have to carry out their observing from relatively light-polluted sites. Fortunately this is not the problem it used to be, and a combination of skill, observing techniques, and modern technology, such as image-intensifiers, can now be used to astonishing effect to view the night sky in real-time. Illustrating the book with images and some of his own superb drawings, Antony Cooke explains how to observe some of the most spectacular objects from less than perfect observing sites. Really Helpful Book !His Advice Works! GREAT BOOK - REALLY HELPFUL With practical advice that assisted in my viewing techniques. I had previously considered only a few deep space objects to be viewable from my home.Instead, by combining all of the options available today, the writer shows that our viewing potential is now less limited in poor locations.Plus, not only did he open my eyes to new ways to look at things in deep space, but runs the entire gamut to include new insights on the moon and planets, staples of the city dweller. Cooke offers many solutions, and image intensifiers and huge scopes are certainly not the only ones, as I have read in more than one place! He merely tries to explore every possibility at these locations, so it baffles me that one reader was not more open to the various ideas, Cooke presents.Plus, there are also loads of illustrations.I particularly liked the catalogs of potential deep space objects for miserable skies. Highly recommended, this book is probably already a classic to those who have it; essential reading for every suburban astronomer. appropriate in providing visual clues for a wide range of equipment possibilities. That should be the title to this book-- because it addresses little else applicable or useful to those using different equipment in an urban observing program. Frankly, this book reads like an infomercial for Collin's image intensifiers--who wrote the forward and the only technical chapter in the whole volume, an appendix chapter detailing the specifications of his image intensifiers. Other specialized urban observing techniques and problems/solutions are covered sketchily or not at all--light pollution filters get *one* page total! Weather patterns and their effect upon urban seeing and transparancy are only mentioned in passing. That's all fine *if* a text on the capabilities of image intensifiers as used with large aperture newtonians--on the California seaside, the author's sole observing locale-- is all one is after, but for the majority of urban observers--those not possessing or planning to aquire this type of equipment--there is precious little useful information contained between the covers of this book. Much space is devoted to examinations of sketching techniques and live video with a large section devoted to a sort of grab bag of lunar and planetary features. These expansions have nothing to do with the purported subject of this book and are in any case much better addressed in the many excellent books devoted to those specific subjects. In the deep sky sections the many drawings and video captures are virtually all illustrate the view to be had through use of an image intensifier, rendering them less than useful for a typical visual urban observer not using such costly devices. 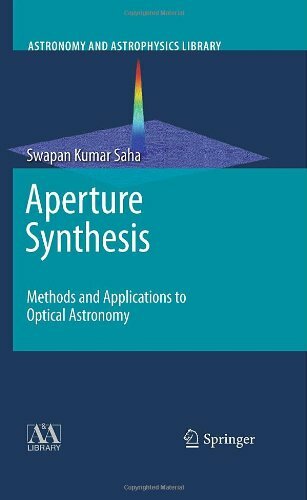 In sum, this book probably represents the best text available concerning the capabilities of image intensifier use on large aperture telescopes--but communicates little of value to the urban/suburban observer otherwise. Great book! Packed with useful information, incredibly thorough and well researched. Cooke is obviously passionate about his subject, and conveys this on every page. Forget sleep, nights are for galaxy gazing, wherever you live. 18. Astronomy in the images and figures. / Astronomiya v obrazakh i tsifrakh. How would you like to get started today in the fascinating hobby of astronomy? Let The beginners guide to astronomy take you by the hand and guide you on your memorable journey through the universe around us. From our small world we have gazed upon the cosmic ocean for thousands of years. Ancient astronomers observed points of light that appeared to move among the stars. They called these objects planets, meaning wanderers, and named them after Roman deities - Jupiter, king of the gods; Mars, the god of war; Mercury, messenger of the gods; Venus, the god of love and beauty, and Saturn, father of Jupiter and god of agriculture. The stargazers also observed comets with sparkling tails, and meteors or shooting stars apparently falling from the sky. Since the invention of the telescope, three more planets have been discovered in our solar system. The science of astronomy is ever expanding. The beginners guide to astronomy will provide you with an understanding of astronomy and the universe around us. From our closest neighbors, the moon, sun and planets to the distant reaches of the universe, the stars and constellations,The beginners guide to astronomy is your ultimate guide.The beginners guide to astronomy begins with a basic understanding of light and color. In the first three chapters you will learn the important role these forces play in astronomy and an understanding of the universe. Exciting experiments will help you in your learning. Next we will examine the instruments used in astronomy and you will learn how to build a simple spectroscope from low cost materials. Then it's on to our sun, moon and planets, where you will learn there distance from us and amazing facts about each of these bodies, and then beyond to study the meteoroids, asteroids and comets and ending up at the stars and constellations with star maps for observing the night sky. 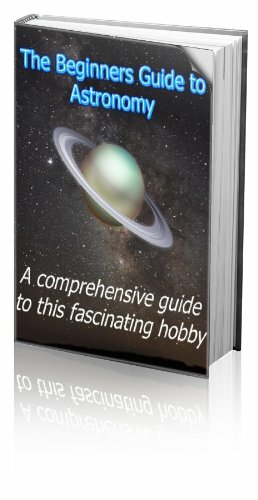 The beginners guide to astronomy is the complete manual for beginning this exciting new hobby. Astronomy is a hobby that will give you years of enjoyment and learning. Order The beginners guide to astronomy for you and your family now and get immediate delivery!